Colossal has been in Williamsburg for over a decade. The team has lived here even longer. We’ve watched the neighborhood transform from coke bars to condos. We could get nostalgic, but you know what, we like change. We have to — we paint over our best work every week. The New Williamsburg brings together the shopping of SoHo, the nightlife of the Meatpacking District, the dining scene of the East Village, and a budding hotel industry with more density than you’ll find in Midtown Manhattan. It’s got all the luxury you’ll find on the other side of the East River, recast on a human scale. We’re not saying it’s small — Yelp lists 506 restaurants in one square mile. Turning left on Wythe at midnight is like trying to get into the Holland Tunnel at rush hour. And we saw our Geopath impressions go through the roof between 2015 and 2016. All that action can be tough to navigate. Lucky for you, we’ve seen it all and we’ve got tips. Read ‘em and reap. Booming bass, cigarette smoke, and European accents fill this gleaming nightlife mecca. And while you might spot a few kids rocking man buns, you’re way more likely to end up talking to off-duty adtech sales people and groups traveling from exotic locations like Murray Hill and Jersey City. Guns N’ Roses, The Roots, and pretty much every jam band ever has hit this stage, but the Blue Ribbon Fried Chicken is the real star. Giant record store with a venue run by Bowery Presents. Your new favorite band will play here before they upgrade to Brooklyn Steel or T5. Mismatched chairs, a fire pit, and wine served in paper cups at this live-streaming radio station and coffee shop make it feel like your own backyard. This long-time fave is basically a clone of Bowery Ballroom. Head to the raised platforms on either side of the stage to get the best view. Former Pacha owner Eddie Dean gave Verboten a fresh start with new speaker stacks, bottle service, and brunch. Two words: Sade night. If you want more than two words, check out this New York Times article: Kinfolk has Become a Williamsburg Cultural Hub. Brooklyn’s best view of the Manhattan skyline. Enjoy a Viking Shandy, made with aquavit, gin, saison beer, strega, lemon, grapefruit, dill, and coriander, then find the best light for your Instagram. Solid dive from the owners of another long-time neighborhood favorite, Lucky Dog. They’ve got pinball and a lineup of beers that’s always good and never snobby. Our order: marinated shrimp tacos and the River Styx — a boozy blend of habañero tequila, aquavit, rum, pale cream sherry, passionfruit, cinnamon and pink peppercorn. If you’re curious about the scene but you can’t make it out here, or if you think staying up til 4 AM sounds like torture, don’t worry — we brought Williamsburg’s nightlife to you. Williamsburg’s world-class restaurant scene is one part East Village Michelin stars, two parts creativity, served in a softly-lit wood and brass interior. Long-term residents will share our love for the $4 falafels at Oasis, but more often than not, the crowds pouring out of the Bedford stop are beelining towards farm-to-table feasts, ready to drop serious cash. A low-waste, white-walled space with a brunch so good, the New Yorker calls it hedonistic. Big-in-Manhattan Andrew Carmellini’s first outpost in Brooklyn has a wood-paneled dining room and a massive wood-burning oven. Williamsburg is overflowing with consciously-sourced food in casually fancy digs, but this was one of the first and is still one of the best. Aziz Ansari is a regular, and he even put it in his show. A 20-year-old restaurant in an old dining car. Be prepared for your server to plop down next to you and help you choose what app to get with your grass-fed beef burger. A damn fine cup of coffee — you just have to wait ten minutes for your pour over to pour over. Gaze at the Manhattan skyline while your ramen burgers, raindrop cakes, and lobster rolls send you blissfully off into a food coma. People start lining up hours before the brewery opens each night. Thousands enjoy the tasting room and a few lucky souls get a free tour. There are only ten restaurants in all five boroughs of New York City that can boast a two-star Michelin rating. This is one. Open a new tab and make a reservation right now. Williamsburg has played host to the best under-the-radar vintage shops and local boutiques for well over a decade. But the early teens saw an influx of corporate giants (hello, Apple store!) as the neighborhood gained traction as a global shopping destination. Today, Wythe Avenue is a magnet for both iconic global brands and offbeat indie designers. Clocking in at 7,300 SF, the sprawling Brooklyn outpost of this Japanese favorite has all the minimally-designed essential oil diffusers and utilitarian-chic jackets your Kondo-ed heart desires. Cop a branded bucket hat to go with your Gucci tracksuit then drop into this store’s raised wooden skate bowl. You’ve just earned 20 hypebeast points, redeemable for a Budweiser at the register. No, Williamsburg’s not just for inked-up, unemployed artists anymore. It’s also for inked-up artists who landed jobs at creative agencies in Manhattan and need to invest in power shirting. Ask the in-house tailor to embroider #alwayshandpaint onto your new Authentic™ Vintage® jacket. Now it really stands out from the rest of your selvedge denim collection! This weekly flea market is the best spot for lovingly handmade necklaces and colorful vintage clothing. Keep an eye out for the fashion students from FIT peddling their one-of-a-kind creations. This five-story Urban Outfitters features the usual offerings alongside rotating pop-ups and events. Check the calendar for your next chance to meet Lil Yachty or eat BBQ with Action Bronson. Vans’ new space is so fresh it hasn’t even hit Google Maps yet. Past the iconic shoe collection and skate gear, hypebeasts will find the Custom Design Studio, where they can create their own kicks. The cobblers at this long-standing favorite (actually on N. 10th) will resole your shoes in the summer and help dig your car out of a snow bank in the winter. Motorcycle shop that builds a small number of custom bikes each year to carry on Indian Larry’s legacy. Main Drag is THE place to take your guitars and vintage synthesizers for repairs. They’ve also got a solid selection of secondhand gear. “The Beating Heart of NYC’s Underground” has found a new, fitting home, curating and slinging records underneath Output. Michelin starred dining, hand-mixed perfume, swanky waterfront condos... Williamsburg is known for the finer things in life. But its mashup of craft and luxury has also given staple items a high-end makeover. Here are six of those fancy basics you never knew you needed. You’ve heard of celebrity plastic surgeons, but have you heard of celebrity piercers? 108 Atelier owner J. Colby Smith has put holes in the likes of Scarlett Johansson, Emma Stone and Zoe Kravitz. Schedule a private, one-on-one appointment for the perfect tiny nose ring. Aesop products are to bathrooms what Louis Vuitton bags are to women’s handbags — a status symbol that lets your house guests know that you’re okay with spending $50 on soap. But did you know they make a dog shampoo that smells just as rich? The small-batch ice cream shop is best known for their Honeycomb flavor, but take it from us — you want the ink-colored Black Sesame Ash Cake. Not to be wasted on fussy toddlers with undeveloped palettes. Mild or masochistic? Whatever your tastes, these purveyors of fine hot sauces offer guided tastings and are happy to recommend the perfect food pairing for your sauce of choice. Hand-thrown ceramics have been having a moment ever since young chefs started outfitting their critically-acclaimed outposts with earthenware. Make your Lean Cuisine feel a little more 5-star with a unique piece for your kitchen. With craft cocktails and truffle popcorn delivered right to your seat, you’ll wonder how you could watch a J.Law arthouse film any other way. Young families are the beating heart of the creative elite. You can spot them lounging along the waterfront on sunny weekend days, browsing listings for apartments that’ll fit a Maclaren and a crib. In a few years they’ll book it to New Jersey for a house they can go HGTV on, but until then, Williamsburg is the official home of the Cool Parents. The hotels that sprouted out of the ground in the past five years are like towering exclamation points on a sentence about Williamsburg’s complete transformation. More than just a place to crash, each is a destination in its own right. We’ve even seen Diddy making the rounds. The Williamsburg hotel that inspired all other Williamsburg hotels, with exposed brick, wooden beams, and Instagram-worthy views. We don’t always eat avocado toast, but when we do, it’s the one from this hotel’s cavernous, eclectic bar. Add a poached egg. Thank us later. You can’t miss this sleek, 21-story tower — or its amenities, which include a 60-foot pool, an elevated park with a gourmet burger truck, and a rooftop bar with 360-degree views. Books curated by Brooklyn residents, decor by local ceramicists, and bespoke linens by Dusen Dusen will Brooklyn-ify the latest from this British chain. Day passes to the rooftop pool turn this spot into a capital-S Scene, but sometimes you gotta treat yourself to a dip and a mojito. A Vice office and a Viceland studio bookend Wythe Avenue. 1,000 employees bounce between the two, feeding the $5.7 billion media giant. The company’s 40,000 SF photo studio cranks out 19,000 images a day for Amazon Fashion, Shopbop, and MYHABIT. Sneakerheads rejoice — Greats opened a studio and showroom at their new office, so you can try your favorite kicks from the latest drop. Our good friends at D&C are on Nike’s speed dial, but they still find the time to do cool things for Colossal. Creative shop with 13 Webby awards and a client list that includes the Lincoln Center Theater and the City of New York. 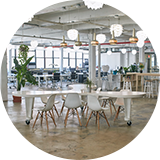 The OG co-working space has two locations in Williamsburg, with 100,700 SF of office space between them. Which came first, the organic produce or the boutique fitness franchise? It’s a classic chicken-and-egg question. Whatever the case, the sidewalks are overflowing with sneakered feet hoofing it towards studios. Hot yoga isn’t for everyone. Neither are pummeling hip hop beats. But if you’re into the two, you’ll feel like a million bucks after an hour here. Pull a T-Swift and shake it off while dreaming of becoming Misty Copeland. Spin cynics begrudgingly admit: SoulCycle’s kind of great… if you can score a bike. Devotees fill up most classes as soon as they open. Grab a CitiBike and hack together your own spin class along the Brooklyn Waterfront Greenway, better known as the Hipster Silk Road. Make like our Creative Director and bring travel-sized bottles that you can fill with the free Kiehl’s. Go old school and meet your crew on the turf. Check the schedule before you go, though; there are usually more than four permitted games a day. The founders of this hot yoga studio were ousted from the the Bikram empire because they wanted wood floors instead of carpets in their sweaty, 105-degree classes. Hear, hear. From one-of-a-kind feminist mugs at Bulletin to stacks of Everlane shoes under the William Vale, the Williamsburg pop-up scene rivals that of SoHo. Killer views of the Manhattan skyline serve as the backdrop for all your photos of this park’s activities, which include Smorgasburg and the Brooklyn Flea Record Fair. Choose between the big-ticket bands at Brooklyn Bowl and the Ebola infamy of the Gutter. We prefer the latter. Swarms of 20-somethings use their old college tapestries to claim good seats for cult classics playing at McCarren Park during the summer.